Plants mid-brown to yellow-brown, up to 30 cm long but usually shorter, comprising a cylindrical main axis up to 1.5 cm in diameter and a single order of whorled or irregularly inserted , cylindrical basally constricted branches up to 1 cm in diameter. The swollen but turgid and wrinkled appearance of the plant gives rise to the common name “dead man’s fingers”. Structure pseudoparenchymatous, consisting of a surface meristematic epidermis of small cells (ca. 13 x 8 µm diameter), a pigmented cortex about 60 µm deep of closely packed isodiametric cells, an outer medulla of a reticulate network of filaments and an inner medulla of sparse, loosely arranged hyphae. Most of the thallus comprises the mucilaginous central region, which also contains sparse hyphae. Unilocular sporangia in sunken sub-spherical conceptacles that are up to 400 µm in diameter and visible as dark spots on surfaces of main axis and branches. Sporangia clavate to spindle-shaped, to 90 x 35 µm , in large numbers around inner wall of conceptacle, surrounded by phaeophycean hairs. Common in the mid-shore, Recorded along the entire west coast and along the south coast as far as the East London area (1-41). World distribution: Namibia, Chile, Tristan da Cunha, Amsterdam Island, New Zealand, Australia (Guiry & Guiry 2011). Note: An alternate filamentous phase producing plurilocular sporangia is reported in Australia from culture (Price and Ducker 1966) and in the field (Womersley 1987). 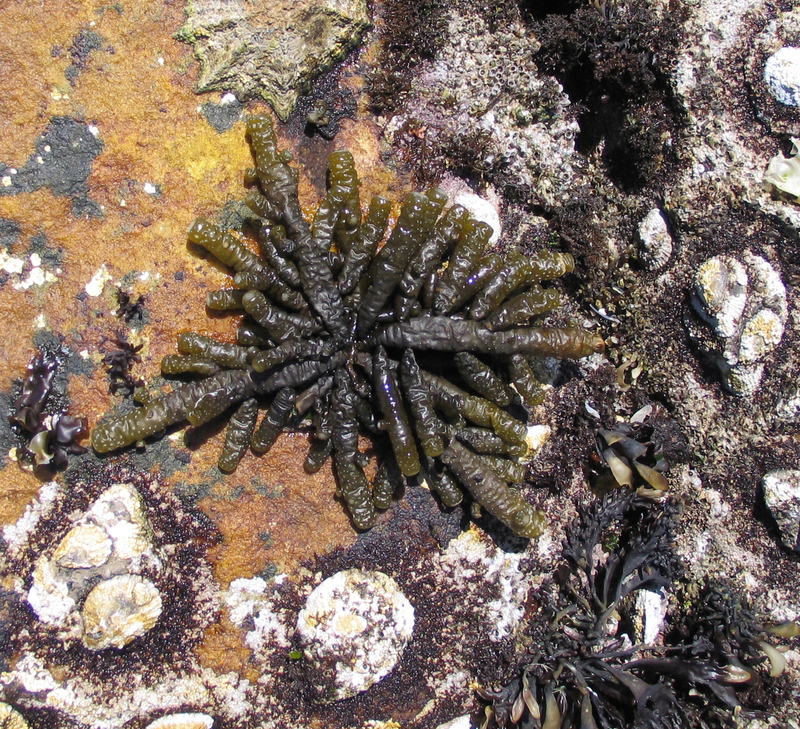 Splachnidium rugosum, exposed during low tide. Splachnidium rugosum with shell fragments attached to base. 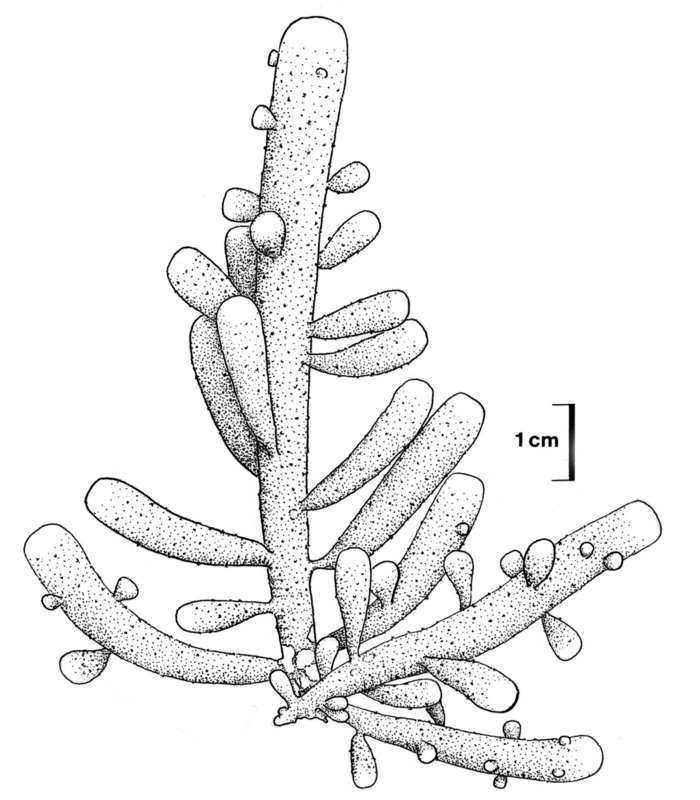 Splachnidium rugosum (reproduced from Stegenga et al. 1997). Price, J. H. and Ducker S. C. 1966. 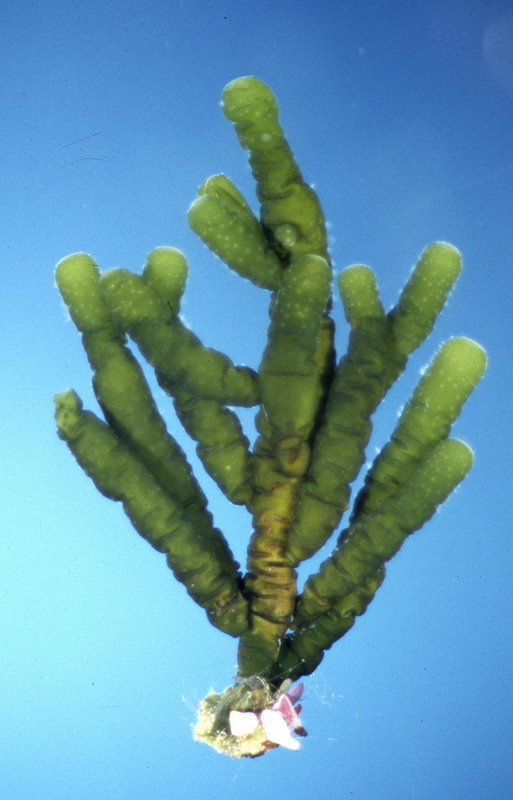 The life history of the brown alga Splachnidium rugosum. Phycologia 5: 261-373.